In a bid to convince IT managers to switch to Google's Apps suite, the search giant has invested in billboard advertising in four cities. Real adverts. In real life (IRL). 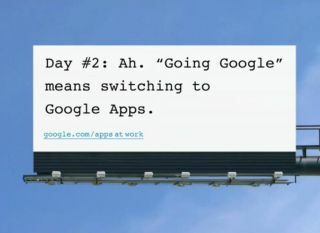 As part of a campaign that will run over one month, Google will update the billboards with a new slogan every day. The idea is to attract those bored IT workers stuck in traffic, extolling the virtues of Google's cloud applications. It aims to take some of the market share from rival Microsoft, which will launch a free cloud-based tool suite when Office 2010 finally lands in our lap. Google currently has 1.75m subscribers to its Apps service, and hopes that this move will convince the decision makers that free collaborative tools are better value for money over Microsoft's pricey software. Check out the video of the billboards in action on YouTube and see if you feel the urge to drop Office and head into the cloud.